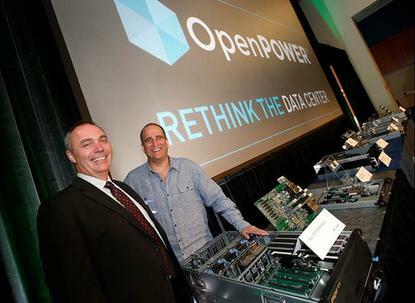 At its inaugural summit, the OpenPower Foundation's chairman Gordon MacKean (left) and President Brad McCredie unveiled an expanding hardware ecosystem. IBMs effort to challenge Intel's data-center dominance by getting hardware makers to use its Power architecture is gaining steam. On Wednesday IBM said that Taiwanese server company Tyan will deliver the first commercially available OpenPower server in the second quarter. The two-socket system is aimed at hyperscale customers such as Internet service and cloud providers. IBM's own OpenPower server called Firestone will target HPC users and is due out later this year. Automotive-parts supplier Delphi is sending a self-driving Audi SUV from San Francisco to New York starting on March 22, attempting the first cross-country trip by a fully autonomous vehicle, Computerworld reports. The plan is to test Delphis wireless communications and automated driving software under a broad range of real-world conditions. Six Delphi engineers will be along and presumably taking turns riding shotgun. Obamas proposed data breach notification bill is the proverbial road to hell thats paved with good intentions, in the view of some of its critics. During a Congressional hearing Wednesday, bill opponents said it's not broad enough, and that it will be counterproductive because it will weaken existing state laws. Users who have been good about keeping their Windows OS up to date should have a pretty easy route to the next big release, Microsoft revealed at its WinHEC conference in China. And upgrades to Windows 10 will be free, as long as you make the move in the first year after launch. High-end flagship phones get most of the attention, but ultra-cheap smartphones are selling like hotcakes, especially in markets like India, and Microsoft is angling for is share. On Wednesday, it launched the Lumia 430, a dual SIM phone, priced at US$70. It will be available in the Middle East and Africa, Asia-Pacific, Russia, Kazakhstan and Belarus starting in April, followed by India toward the end of the month. Ciscos shipping department is going to some lengths to reassure customers who are worried after it was disclosed that the U.S. National Security Agency has intercepted equipment en route to plant surveillance backdoors. The company will ship boxes with faked addressees, its chief security and trust officer told an audience in Melbourne, according to The Register. Some customers opt for carry-out rather than delivery, and go right to the distributor to get their equipment, he said. California taxi firms have sued Uber, claiming that false advertising by the ride-hailing smartphone app have damaged their business. The lawsuit borrows heavily from claims against Uber filed by the district attorneys of San Francisco and Los Angeles in a consumer lawsuit in December. The focus of the cab companies is on recovering damages and getting an injunction against ads from Uber that promise a safer trip. The Frankfurt Regional Court has issued a nationwide ban against Uber's low-cost service UberPop, ruling that mediating rides with private drivers who don't have the required licenses is illegal. When UberPop was banned by a different court in Germany last September, it simply ignored the ruling, and the temporary ban was lifted after a few weeks anyway. This time, Uber plans to follow proper legal channels and officially appeal. Now that the dust has settled, how does the Apple Watch stack up against the Pebble or the wait-a-while alternative? What went wrong with Google Glass? Astro Teller, director of the GoogleX research arm, shared some thoughts at SXSW this week.